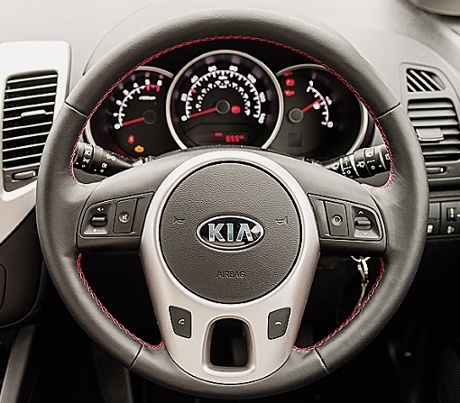 The power to surprise, is the Kia’s motto. You see, even that’s wrong: we all have the power to surprise. The hard part is being able to give people a nice surprise. The headline problem here is that the Kia is so underpowered. The 1.4L diesel engine seemed to run out of puff going round a corner. Long-distance driving was miserable; it was never happy in any gear. The brakes felt squelchy and uncertain. It was skittish on the motorway, making heavy weather out of the slightest change in road surface. At 71mph, the rear-view mirror shook, giving the impression that the cars behind were vibrating. To the very front, are two triangular side windows – their purpose could only have been decorative. But by some law of physics that car designers ought to know, they reflected the white lines of the road into the sides of the windscreen, so you drive with a perpetual flashing on both peripheries of vision. It was exhausting. I’d emerge from the car shaking my head, as if concussed. The light, tinny fitments of the cabin undermined all the natural authority that should emanate from a car. Cheap-looking armrests flapped down to interfere with the usability of the hand brake. The engine started reluctantly, always raising the possibility of failure. It’s the first car I’ve been in for ages with neither satnav nor docking station. A USB port made nonspecific promises. It didn’t look as if you could connect an iPod, but perhaps you could charge it? Nope. The parking beep is sluggish – you’d be better off using your own senses. Even though it is short, the combination of width and blunt steering meant it had none of the nippy mischief that makes the compromises of a small car worthwhile. And yet, the boot was surprisingly large. The back seat could accommodate three adults (many small cars make this claim, but they’re often talking about child-sized adults). The on-paper combined mpg is good, beyond diesel-good – heaps better than the petrol version, which might make you feel better about the pokelessness. They say emissions are so low they didn’t feel the need for ISG technology (Intelligent Stop and Go). They could go lower if they were serious about it, but cost is the third factor: anything to push it above £15k would make serious mincemeat out of its competitiveness. I did not like it. Is that coming across? Not one bit.